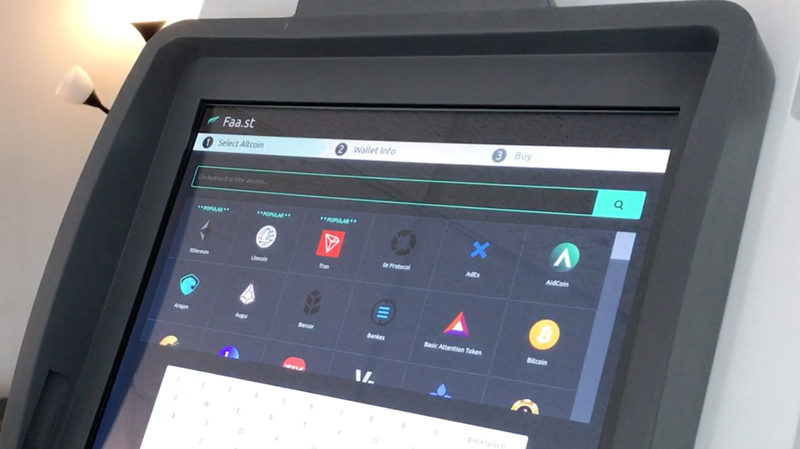 Today we’re proud to annouce that Faast is now officially integrated into all Bitcoin Teller Machines (BTMs) running Bitaccess software. Now you can use our BTMs to buy 70+ altcoins with cash, or sell them for cash on the spot. BTMs represented a quantum leap forward in the evolution of cryptocurrency. Over the past few years, they have helped drive adoption by offering a seamless portal between cash and bitcoin. This was (and still is) especially valuable for people that may not otherwise be able to access cryptocurrency. Despite the major downturn in crypto prices during 2018, use of our BTMs remained steady throughout the year, with an median buy and sell amount of $100 and $250 since March ’18. During this time, the Faa.st and BTM projects remained separate. But our long-term goal was eventually to combine these two products into what we have built today: a complete, frictionless ecosystem for buying, selling and allocating cryptocurrency by linking the fiat and digital asset worlds together— all while cutting out centralized exchanges to the maximum extent possible. Clearly, the public has not lost faith in cryptocurrency, and that’s why we made the decision to make more digital assets available to our customers on our BTMs. Go to https://bitaccessbtm.com/ to find the BTM closest to you. Visit a BTM, and touch the “start” button on the touch screen. Enter your cell phone number to receive a confirmation code via SMS. This code will allow you to proceed. On the screen you will see a variety of options for buying and selling BTC, verifying identity (required in some jurisdictions), and a new button for altcoins. Touch the “Altcoins” button. A menu will appear with icons of the newly added altcoins. You can also type in the coin you want using the touch keyboard on the screen. Select the cryptocurrency you would like to purchase. Show the QR code for your wallet to the BTM camera so it can read the address. The next screen will ask you to insert some cash. Confirm information on the screen, then touch the “I’m done” button. A confirmation screen will appear when the transaction is complete. You’ll receive a confirmation text on your phone with a link to a receipt of your transaction. This receipt will contain the date, time, fiat and crypto amounts, tx hash, and the wallet address, as well as the location of where the transaction took place. And there you have it. Seamless, easy transactions for 70+ crypto assets without requiring an account. It doesn’t get any easier than this. The next chapter in cryptocurrency has begun. Go to https://bitaccessbtm.com/ to find the BTM nearest to you, and start buying and selling altcoins today!